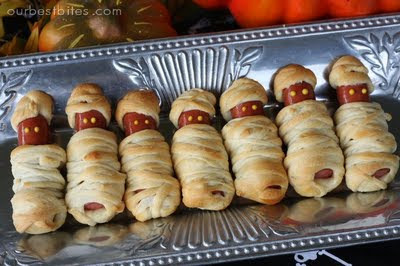 Well this is quite possibly the CUTEST compilation of Halloween-themed snack foods that I have ever seen. I added this fabulous blog to my Reader faster than you can say "Great Pumpkin!" Candy Corn Cupcakes -- how adorable, and these are easy to make with a little food coloring. 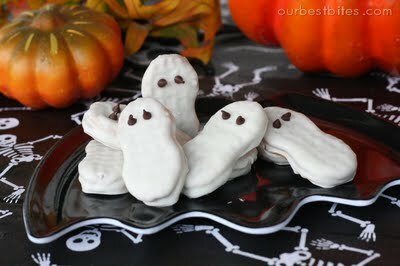 Nutty Ghosts -- no recipe even needed! Mummy Dogs -- no recipe needed for this one, either, but how cute are they?! Yum! Sara (and Kate) at Our Best Bites is one of my new favorite bloggers for quick and easy party fare. Thanks for the ideas, Sara -- I can't wait to get baking!